1. Ring light efficiently removes sharp shadow, and is especially ideal for beauty facial photo-shoot. 2. This light ring has 168 Pieces SMD LED bulbs with a wide dimming range from 1%-100%. You can use filter to adjust the lightness easily. 3. Compatible with iPhone6 plus/6/5/5S, Samsung Galaxy S6 Edge/S6/S5, and other smart phones, and all cameras. 4. Constant current drive, low power loss, low heat output, more than 50000hrs service life. 5. Widely applied to YouTube videos, makeup, Studio shoot, video blogging, portrait photography and live streaming etc. The light stand is constructed from aluminum alloy, giving it exceptional strength. 【Ring Light Dimmable】- Dimmable 14"/35cm Outer 41W 5500K 168 Pieces LED bulbs with a wide dimming range from 1%-100%. Special LED SMD design, lightweight and portable. 【Ring Light with Stand】- The legs of stand can be folded up and fixed with a locking device easily. Lightweight for deposit and carry. 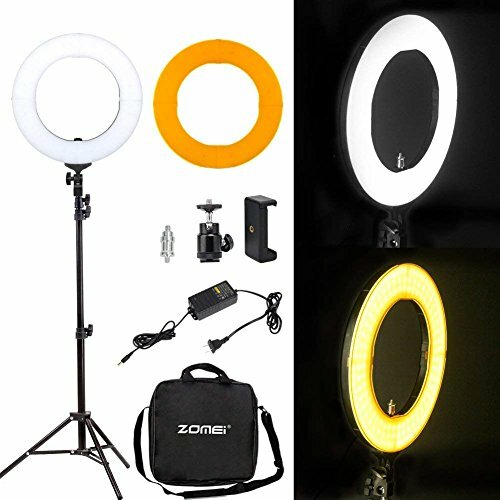 【Package Included】- 14 inch dimmable ring light kit including light, tripod head, carrying case, phone holder and additional diffuser. 【Multiple Purpose】- Widely applied to YouTube videos, makeup, Studio shoot, video blogging, portrait photography and live streaming etc. 【Environment Friendly】- No ultraviolet and infrared light radiation, low heat output, safety and environmental protection.